Really late post today, one of my friends from uni came down to visit me! I haven't seen her in a few months because she was travelling around America, so a few episodes of Gossip Girl, a Nando's takeaway and a catch up were in order before I could do today's post! I have one of my Llarowe polishes to show you tonight, Rosa Star from Up Colors. 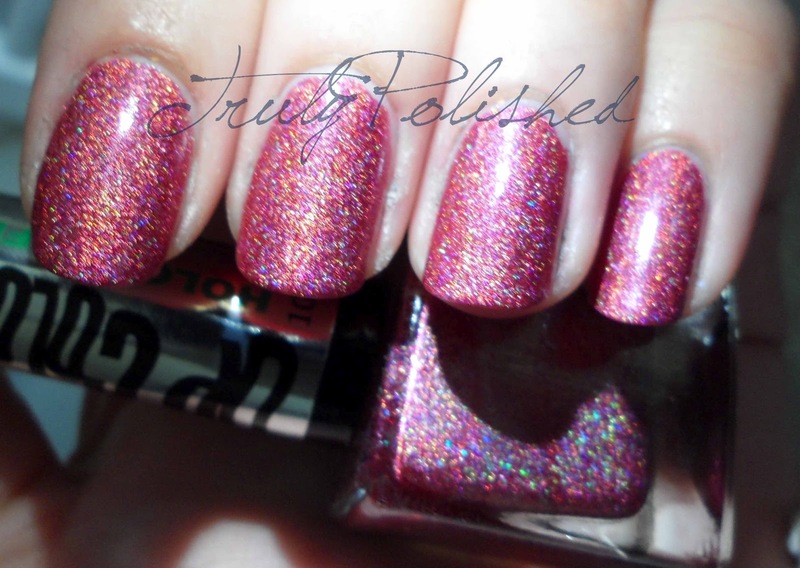 This is a rose pink holo polish. It does have a linear effect but if you're looking for a replacement for any of the HITS No Olimpo polishes you won't get that from Rosa Star! Despite that this is a really gorgeous polish with an amazing formula. I had full opacity in one (very easy to apply) coat, but I applied a second coat for the pictures as I think this increases the holo effect of any polish, so the photos below show two coats of Rosa Star. I didn't use topcoat because I think it dulls the effect. I had to get my boyfriend to help me with the artificial light photos! I used my phone torch and unfortunately I don't have three hands! I think that picture really shoes the holographic effect so it needed to be done! I think you'll agree this polish is beautiful! 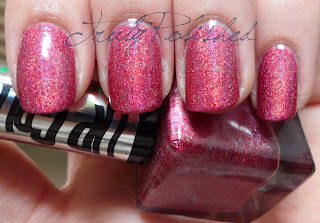 If you love this polish as much as me, you can buy it here at Llarowe for $9. They also ship internationally, which is a bonus if you live in the UK like me! I had never even heard of this brand until I was poking about on the Ninja Polish site. I've ordered four of their duo/multichromes. Very much looking forward to seeing what they are like. Before I ordered I checked out Llarowe but they didn't have any of Up Polish's due/multichromes.